Bryant McIntosh fires from the corner. The junior guard went 8-for-8 from the field in the second half against Wake Forest. Battling a Wake Forest team sporting a large, talented frontcourt, Northwestern needed one of its players to step up and play bigger than himself to get the win Monday. That player was Bryant McIntosh. After a quiet first half, the junior guard poured in 19 of his game-high 23 points in the second period, leading the Wildcats (5-2) to a 65-58 victory over their ACC opponent. Heading into the matchup, the Cats faced a daunting frontline from the Demon Deacons (5-2). Wake Forest’s two frontcourt starters measure at 6-foot-10, while NU’s biggest starter, sophomore center Dererk Pardon, checks in at just 6-foot-8. But after a tough and competitive first half, the Cats founds themselves down just one point. 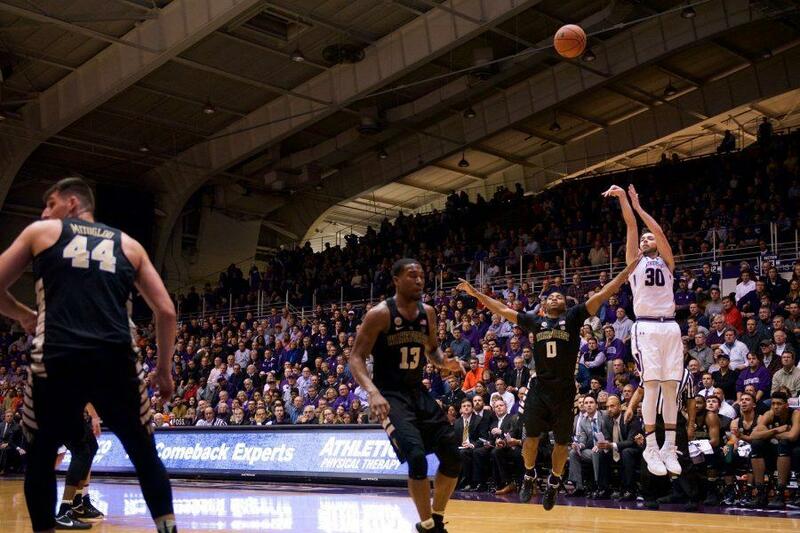 After the break, McIntosh caught fire and guided NU to a win. The point guard led the the Cats’ second-half effort, going a perfect 8-for-8 from the field in 16 minutes of play and executing almost flawlessly down the stretch. McIntosh said some easy baskets helped him get into a groove offensively after a somewhat lackluster opening half. With just under four minutes remaining in the contest, McIntosh scored 10 straight points, and from there he continued to make the necessary plays to help his team close out the victory in Welsh-Ryan Arena. The guard’s late-game heroics energized both the home crowd and his teammates. Senior forward Sanjay Lumpkin said McIntosh’s performance should be no surprise. Lately, though, McIntosh has been cold. He combined for just 15 total points on 6-for-29 in NU’s two most recent games. Monday’s contest was a different story. On a big stage and with two of basketball’s best conferences watching, McIntosh showed he is one of the more impressive guards in Big Ten. McIntosh said his teammates and coaching staff were a big part of his return to form.